This article will explain how to register a club with the Elizabethtown Student Senate. 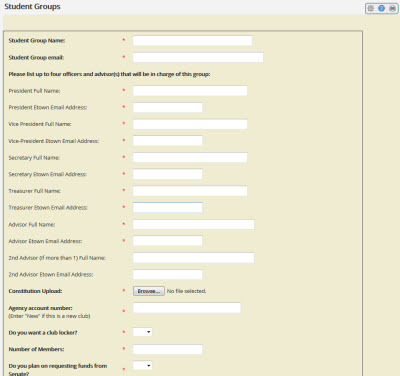 Step 1: Using a web browser, navigate to https://jayweb.etown.edu/ICS/Student/Online_Forms/Student_Groups.jnz, and sign in to Jayweb if prompted. Step 2:In the center of the page, click on the link to access the form. Step 3: Fill out the form, being sure to fill in all blanks marked with a red asterisk. Step 4: Click the submit button at the bottom of the page. The Elizabethtown Student Senate will then either approve or deny the registration. Clubs need to be registered with Senate in order to have access to email, network drives, printing, and 25Live accounts. For additional questions, please contact clubs@etown.edu. For questions regarding email or network accounts, please contact helpdesk@etown.edu.